Courtesy of Wikipedia.org. Public domain. Former President Jimmy Carter recently had cancer on his liver removed, and is now being treated for cancer on his brain. 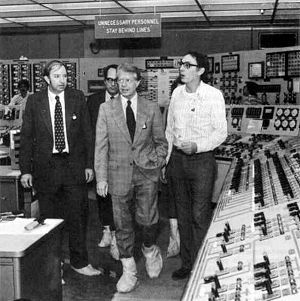 Jimmy Carter helped cleanup a nuclear accident in Canada during the 1950s. As President, he toured Three Mile Island on the fourth day after the partial meltdown, while the accident was still ongoing. And he was part of then-Captain Hyman G. Rickover’s fledgling nuclear submarine program when he served in the Navy. These substantial radiation exposures are risk factors for cancer, but they aren’t mentioned in the (virtually identical) media reports dated August 20. One AP article stated his cancer is probably due to too much sun. Many think Jimmy Carter was just a peanut farmer who became President for one term, and then got involved with Habitat for Humanity. His career is much more extensive. Carter graduated from the U.S. Naval Academy, served on submarines as a Navy officer, did graduate work at Union College (NY) in reactor technology and nuclear physics, and was senior officer of the pre-commissioning crew of the Seawolf, the second US nuclear submarine. He helped shut down and disassemble the Ontario Chalk River Experimental Reactor after it suffered a partial meltdown in 1952. This, plus his exposure at TMI in 1979, together with his exposures in Rickover’s program and in graduate school, are risk factors for his present cancers. Carter himself seems unwilling to bring up this issue. Cancers often have long latency periods and can take decades to develop. Especially now that the Nuclear Regulatory Commission wants to declare “low-level” radiation exposure as beneficial, the lack of information on Jimmy Carter’s background and exposure is suspicious. With no information, there is no bad press for the nuclear industry, no derailing an industry-friendly NRC decision, and no reminders about Fukushima. Remember: NRC comments due September 8. Note: A 2007 New York Times article on the Carter family also sidestepped malathion and pesticide exposure as a reason for his family’s high death rate from pancreatic cancer.